Free Printable Peppa Pig Matching Worksheet. Free Printable Peppa Pig Matching Worksheet activity to share with kids and help them practice writing skills and have fun matching the favorite Peppa Pig characters. You can use this free printable Peppa Pig Matching Worksheet for your school, home-school, tutoring or just for fun. Your kids can match the characters of the animated TV series Peppa Pig with the correct name and then practice writing skills at the same time. Kids can practice writing with 8 words like Peppa Pig, Mummy Pig, Daddy Pig, George Pig, Zoe Zebra, Suzy Sheep, Danny Dog and Emily Elephant. 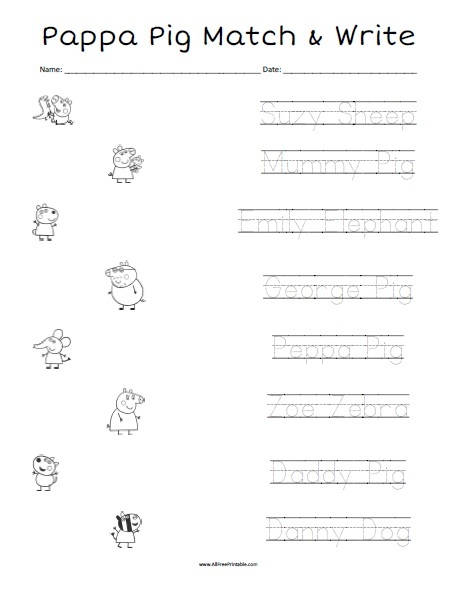 Print this Peppa Pig Matching Worksheet free using your home or school printer. Ready to print free in PDF format.